In the past it was actually illegal in the US to sell imagery with better than 50cm per pixel resolution, but in June 2014 DigitalGlobe was given permission to sell higher resolution imagery – up to 25cm per pixel. One of the photos shown in the clip in the CNN story and also shown on Daily Mail’s version of the story, which shows an overhead shot of people having a picknick is clearly higher resolution than 2 feet per pixel and we believe is not a satellite image. 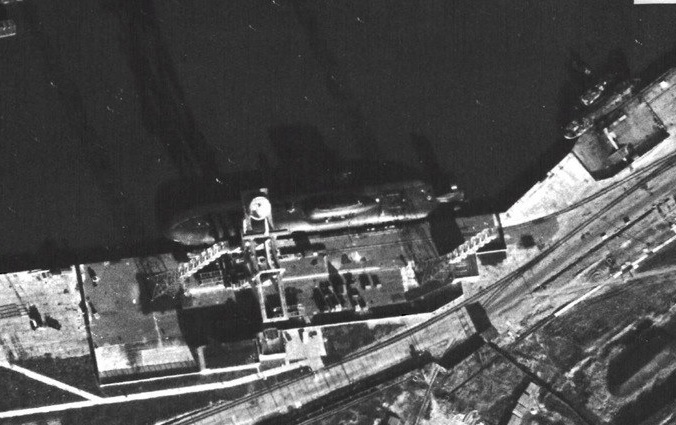 Another of the photos they show is of a submarine at the Russian naval yard at Severodvinsk, which we discussed in this post. At the time we noted that it was a remarkably good image for its age, although not quite as good as the Google Earth imagery. 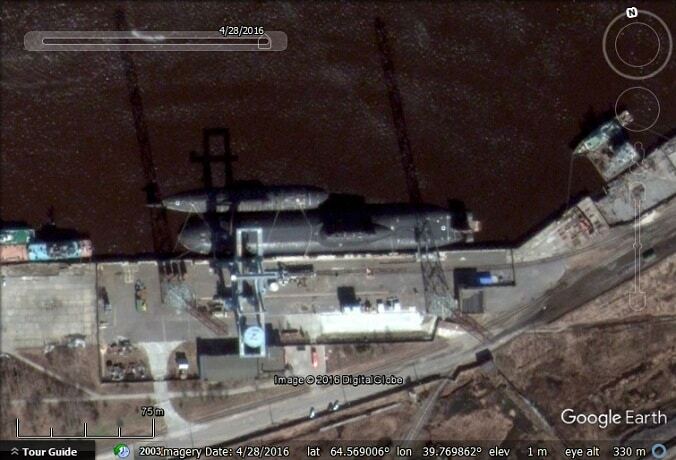 A declassified photo of a submarine (cropped for better resolution) in Severodvinsk, Russia. The image was captured in October 1982 by KH9-17. Full image here. The same location (and probably the same submarine) as seen in Google Earth. It is no coincidence that the company Google Earth originally came from was named Keyhole Inc. It was in direct reference to the Keyhole spy satellites. To this day, Google Earth saves files in the KML format which stands for Keyhole Markup Language. The Corona program (that flew the Keyhole satellites) and most of the imagery from them has been declassified. The imagery can be obtained from the USGS. Some has been digitized and is available to download for free via Earth Explorer (look for the ‘Declassified data’ data sets). For imagery that hasn’t been digitised, for a fee of US$ 30 per scene you can have them scanned. The imagery is not just of Russia and China. In fact the only high resolution imagery we were able to find was of the US and Antarctica. You can read more about the KH-9 satellites on Wikipedia. A documentary about the start of the Corona program can be found on YouTube. So only slightly larger than the KH-9 camera. Interesting. That’s almost 50% more area! My name is Phil Pressel and I am the author of “We Met the Challenge, the Hexagon KH-9 Reconnaissance Satellite.” I was responsible for the design of the KH-9 cameras and its primary mirror was not 0.91 meters. It was 26 inches (0.66 meters, see page 109). It was smaller than the Google earth mirrors and still got better resolution. In my book I discuss the design of the camera and how the whole system worked. It’s advertised resolution as released by the NRO was 2 to 3 feet but actually better at perigee under certain conditions (can’t give the number). Write to me at phil.pressel@gmail.com.